I didn’t grow up eating green tomatoes. In fact – to be perfectly honest – my brother convinced me that I hated all tomatoes at a young age and it took an herb class in high school plus a few more years of exposure before I came to actually liking them. 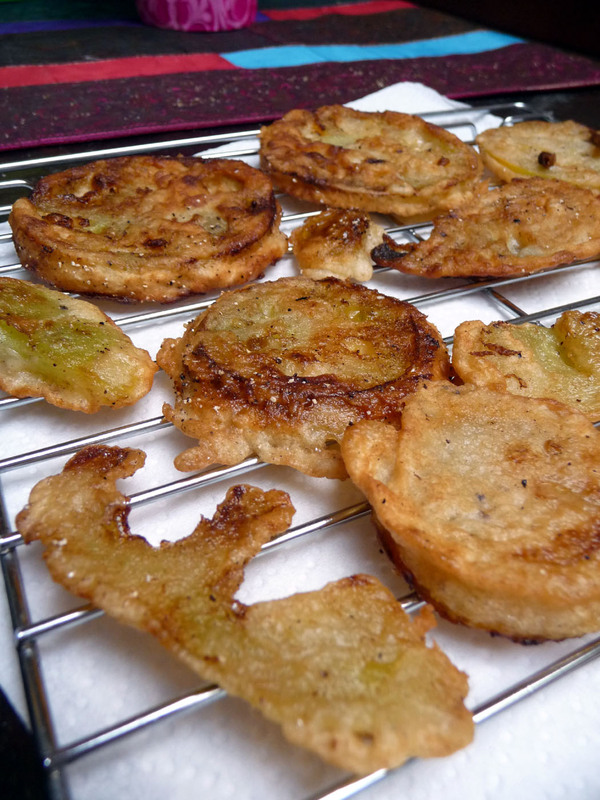 The concept of fried green tomatoes was completely foreign until I was introduced through the classic 1991 film of the same name. Even before I had that tomato-liking revelation I was drawn to the idea of green tomatoes. What did they taste like? Were they better than red tomatoes? Was there a particular way such interesting produce was prepared? When I actually ran into these fascinating specimens last year at farmer’s market (conveniently in the parking lot across from my apartment) I had to pick up a pint. 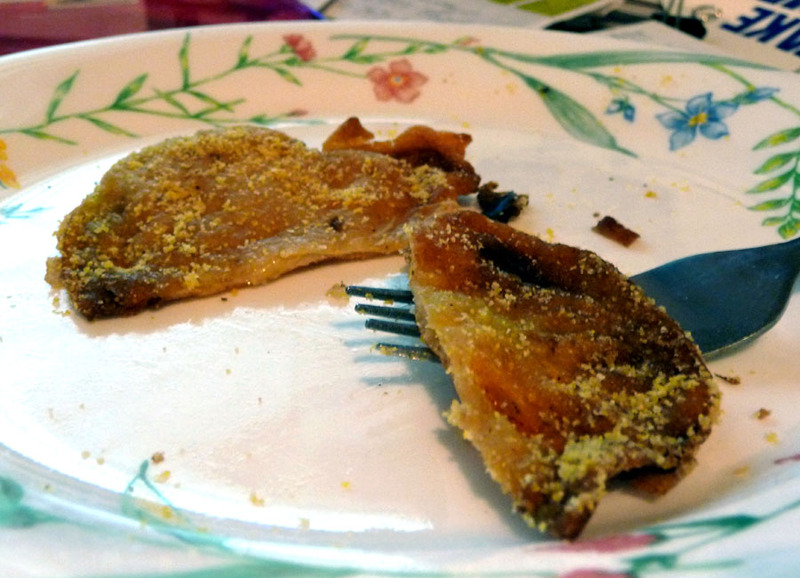 Of course, the only context I had for the fruit was fried so I pulled a pack of tempura mix out of my cabinet and a frying pan from my rack. A mess later I fell in love. I’m salivating just thinking about it. For the uninitiated, green tomatoes are tarter and firmer than red tomatoes with a more intense flavor. You do have to use them fairly quickly because they will turn red on you and fried red tomatoes just aren’t the same. They’re also a whole lot mushier and messier. 2) Put your oil on to heat. I don’t own a fry daddy or anything like that so I use best blend canola oil and a large frying pan over medium heat. 3) Slice your tomatoes. About a 1/4 inch or a little thinner is good. 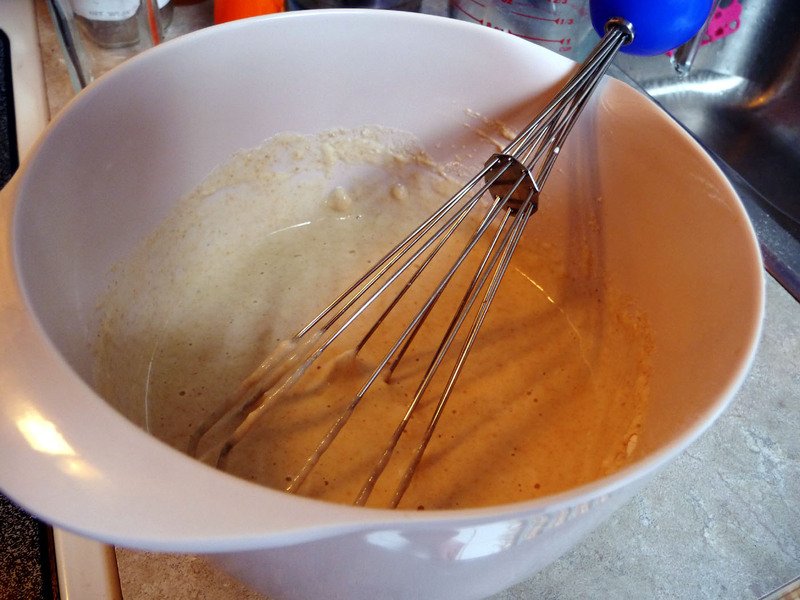 4) Mix your tempura batter, preferably in something you can also use to dip the tomatoes. Beat the egg then add the ice cold water and mix the flour in lightly. Keep your fork, spoon, mixing utensil of choice at hand as you’ll want to do a light mix occasionally so that it doesn’t settle. 5) Check you oil. Put just a drop of batter in and if it begins to sizzle and look more solid you should be good. 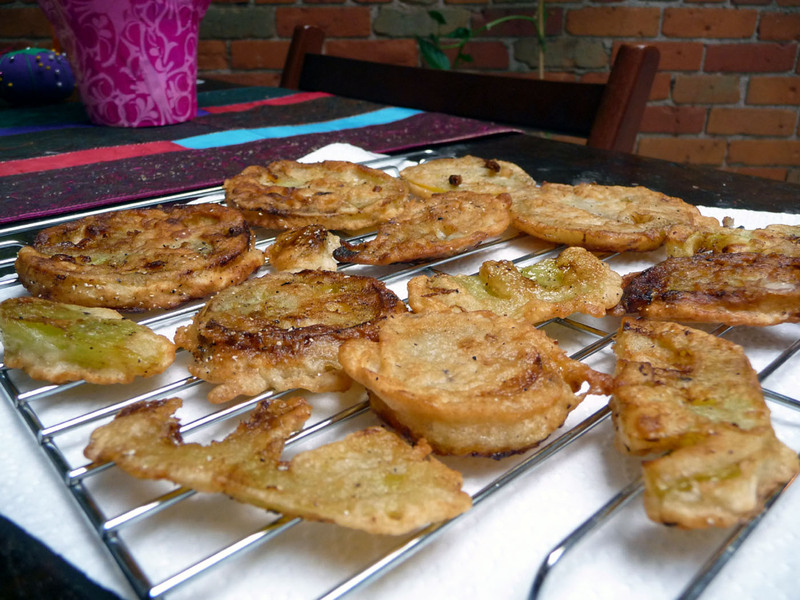 If you’ve never fried before this may take a little experimenting to get right. Just be patient. 6) If your oil is ready, dip your first tomato slice into the batter making sure it is totally coated and drop it in the oil. Repeat until pan has one single layer across it. Once the edges start to look a bit brown flip. Check to make sure the other side is brown, remove and repeat the process until all of your tomatoes are cooked. These are best consumed fresh, but being single I’ve tried several techniques for leftovers. The best results thus far have been from cooling them on a rack and then wrapping them in paper towel. The paper towel absorbed a lot of excess moisture so they reheated nicely in my toaster oven.